What a fabulous sail!We found such ideal conditions that we had to stand "hove to" outside ISLA LOS PINOS until the sun rose high enough to see our way in clearly amid the coral. Our trepidation at the thought of navigating around the reefs and shoals of the San Blas Islands has been a major factor in our taking so long to reach them. I am so glad we finally made it! This area is a sailor's paradise. There are hundreds of mostly uninhabited palm-covered islands with miles of sand beaches set amidst protective reefs. As in the Tobago Cays, you can anchor with nothing between your boat and the ocean but a barrier reef. 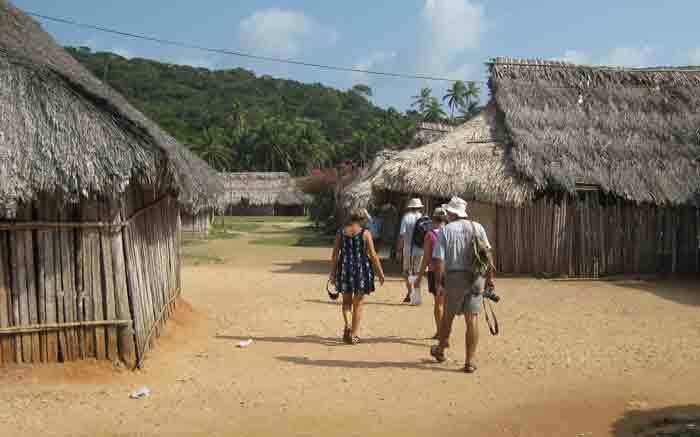 The Spanish name for the area is SAN BLAS. However, this part of Panama is actually the REPUBLIC OF THE KUNA or KUNA YALA. 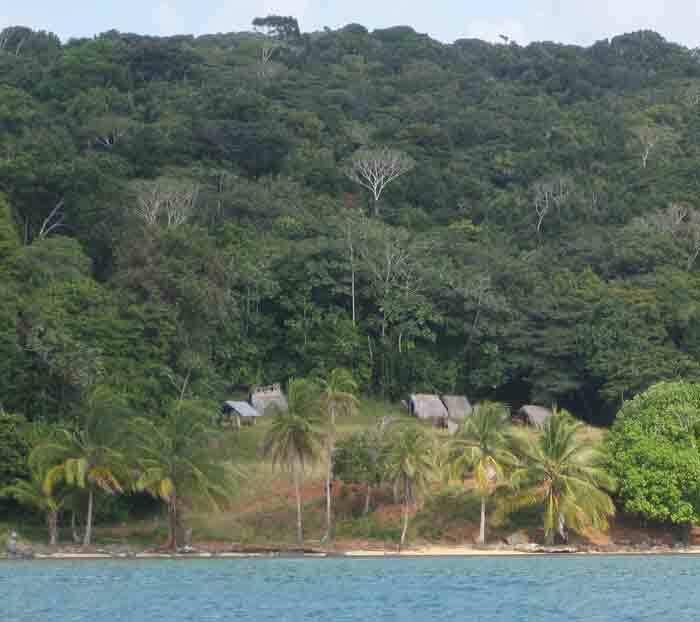 The local amerindians managed to survive the intrusion of the Spanish Conquistadores, disease, privateers and invading tribes which tried to take advantage of their plight and eventually, after rebelling against the repressive Panamanian police posts and a dictatorial governor, achieved autonomous political and judicial jurisdiction over these islands and their mountainous mainland plantations. They have managed to continue their traditional way of life- to a degree. 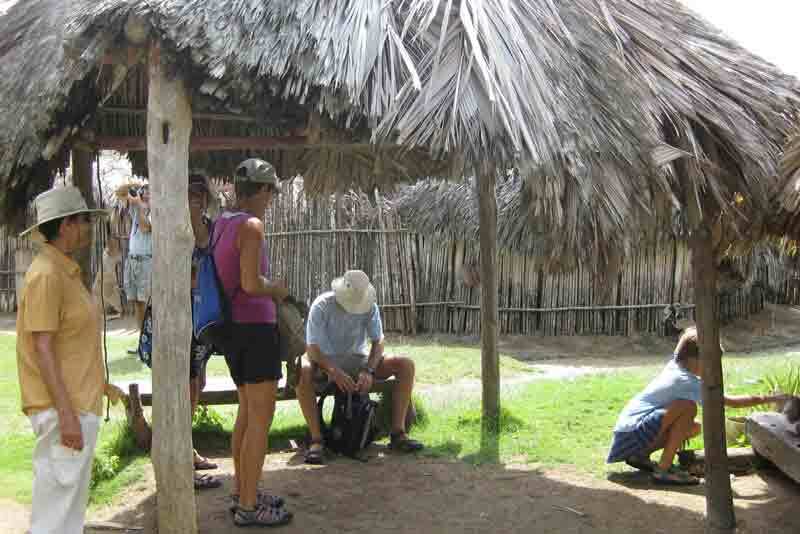 I will try to give you information about their history and way of life as we travel through Kuna Yala. Although we will not have nearly enough time to explore the islands as thoroughly as we would like, we have decided to stop first in the Eastern San Blas as these islands are home to Kunas who have retained their traditions more faithfully than those in the more commercial western area. Our first stop was a real treat. We met up wit EMILY GRACE and also with a Canadian boat we had met in Cholon Bay, NIKAN in the anchorage. 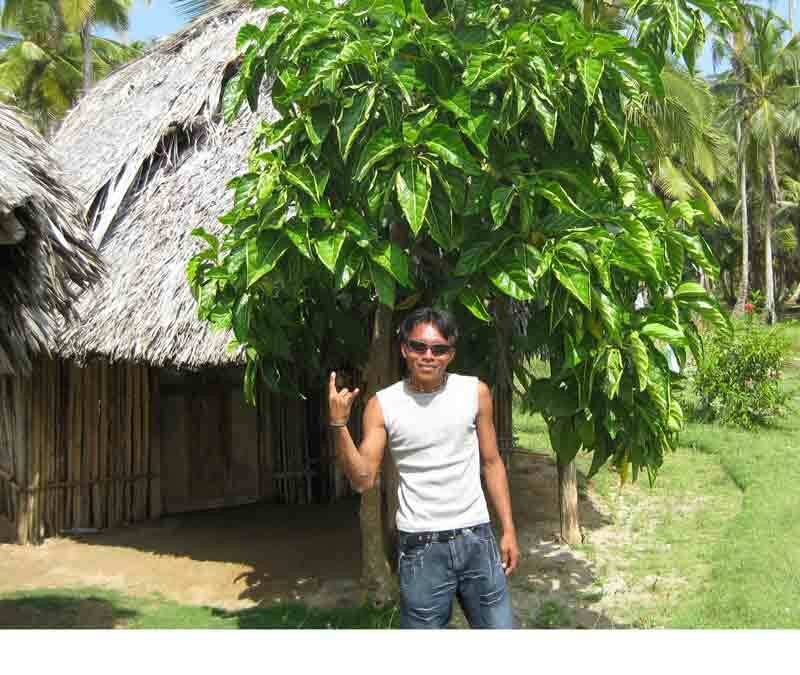 A tour of the island with a handsome local Kuna, David, had been arranged. He is twenty-one and is taking classes in Panama. He speaks English, Spanish and a bit of French. His wife and babies were not in the village when we visited. However, we did bombard him with questions. He showed us his home, which he built himself. The Kuna use fast-growing renewable materials fro their homes. They are sturdy and attractive, airy and practical. The thatched roofs last for about 15 years and take about two months to construct. Hammocks can be strung up from the supporting beams and everything else semms to be stored hanging from them as well. The village is extremely clean and tidy. After we toured the village we started up the very large hill to the communications tower. The Kuna Yala government must have provided banks of solar panels to the villages as they were omnipresent. In the more tradiotional villages, such as Los Pinos, they are used to provide lighting for a couple of hours each night. In the more commercial western villages, televisions and radios were to be seen everywhere. Throughout out stay in this region, we found there to be a lot of clods, thus reducing the efficiency of the solar panels. As cruisers, we felt a better investment would have been in wind generators! We have always felt that cruising is a very healthy lifestyle. On the trek up to the tower, we decided that we may be getting exercise daily, but not the kind that makes clambering up hills easy on old bones! David (and Emily!) found several species of wildlife en route. We all admired the lovely little black frogs with blue-green spots. 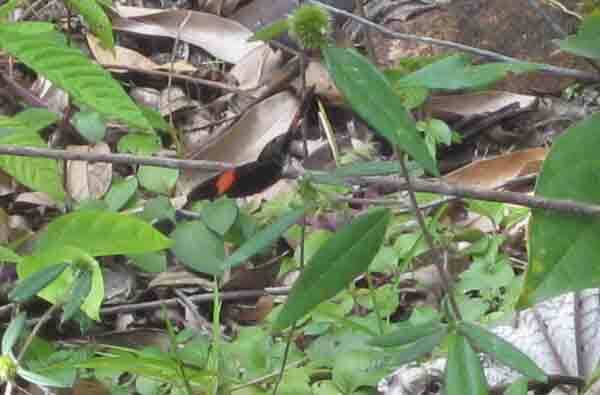 We also looked at butterflies and a long brilliant green snake. David summoned the monkeys, but they would not come out of hiding, even for fruit. Apparently they only approach if you show them a mirror- and, of course no one had one for a hike! Apparently the monkeys on Los Pinos must be very vain! At the top of the hill, David climbed the tower to take panoramic photos for us, while we socialized among the solar panels. On the way up the hill, we saw the cistern for fresh spring water and the stream where the women do the laundry. (At least they can use FRESH water!). Back at the village, we watched david chop up a coconut for preparing coconut rice aboard EMILY GRACE. Coconut has been a source of livelihood for the Kuna. When they were first recognized as an autonomous area , their only income came from selling coconut products and coir. Coconuts are still viewed as money-makers to the kuna and visitors should never take coconuts from the islands- even rotting ones. 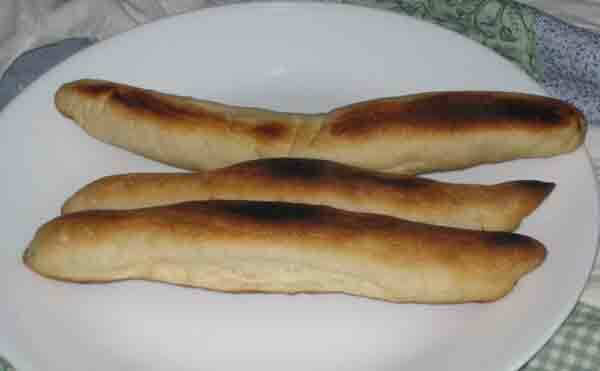 We then bought kuna bread- warning, HIGHLY ADDICTIVE!!!! The village only prepares 200 loaves a day. The bread is prepared with coconut water and baked over a fire made up of coconut husks. It is WONDERFUL. We then dinghied back to the anchorage for a good rest. Los Pinos waterfront. The Kuna use stilted structures overhanging the water as self-cleaning pig pens and also for toilets. View of the cemetery at Los Pinos. Tourists may NOT visit the funeral huts. The next morning we were leaving, but had a big craving for more Kuna bread. We took orders from the other two boats and Dave and I went back to town. We paid our anchorage fee and proceeded to the bakery. There we purchased 50 loaves!!!!! The total cost was $5.00!!!! As you can see from the photo, this really was not pigging out big time! Three loaves on a dinner plate. Before we left, David offered to show us his wife's MOLAS. At last, we were about to see our first long-anticipated molas! MOLAS are a handicraft unique to the Kunas. They are a handstitched reverse applique. Ordinary applique is done by layering pieces of fabric on top of each other. MOLAS are made by cutting pieces out of fabric and layering them so the pattern goes down into the picture. The stitiches are exceptionally small. Four to five layer MOLAS are the most expensive and very rare. A Mola may take a month or two to complete. The early nuns trying to convert the Kunas were shocked at the nakedness of the women. Their only decoration was geometrical shapes painted on their bodies. The nuns encouraged them to develop the mola process and to attach a blouse to the matching mola panels on front and back. Then wrap-around skirts were added and everything topped by a red head scarf. The Kuna women still wear these outfits today. 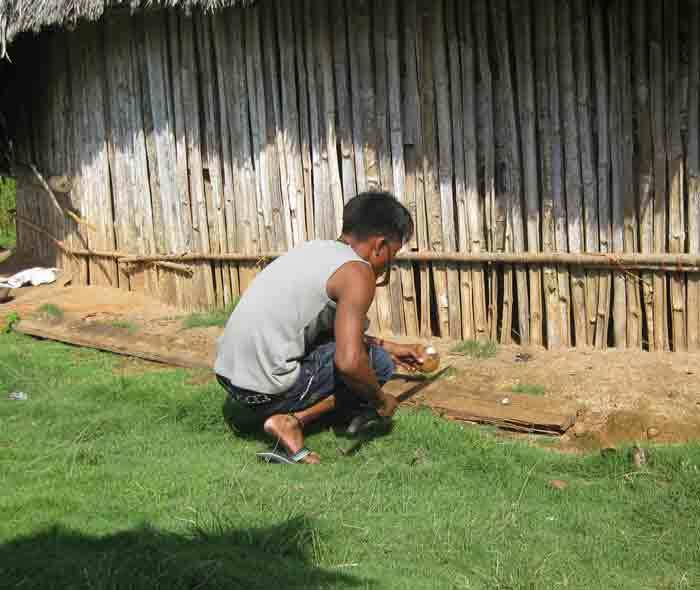 The MOLA panels are now a major source of income to the villages (pueblos). 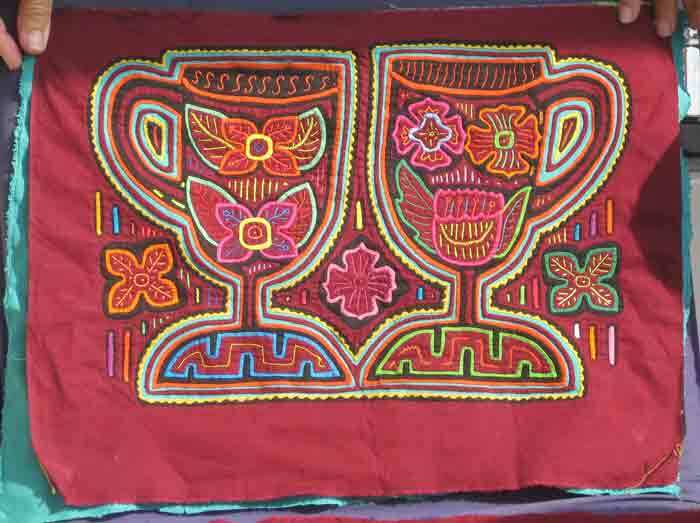 This a mola in the traditional style showing two ceramic cups with medicine flowers. 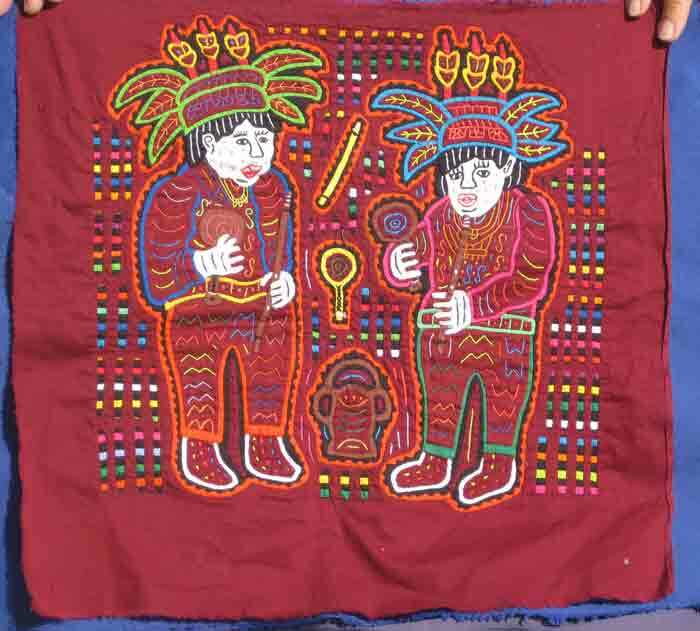 This mola shows two old men at a traditional female puberty ceremony playing flutes and maracas. All in all, a very memorable introduction to KUNA YALA and the kuna culture!